Producers: John Leckie, Radiohead, Jim Warren, Nigel Godrich. Recorded: Rak, The Manor and Abbey Road, London, England. Quick Summary: After Pablo Honey, Radiohead was largely dismissed as one-hit wonders. 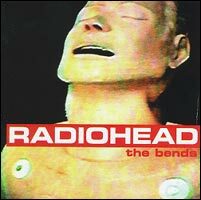 2 years later, they released their second album, The Bends. This album was largely ignored by the public for many months. Though as time went on, reviews started to appear all over the place that The Bends was an excellent LP. Still unnoticed to the public however, with many of the singles drifting in at around 20th in the charts, it looked like it just wasn't going to happen for the band. However, towards the end of 1995, the now unanimously great reviews for the album were getting peoples attention, and The Bends began to climb both the US and UK album charts. Early 1996, The Bends won a host of awards and major critical acclaim as one of the best albums of the year. 13. How Can You Be Sure? After touring for 2 years non-stop promoting Pablo Honey, the band hadn't had a chance to actually sit and write any new material for a long while. The end of the strenuous touring campaign brought them all back to the studio to begin recording on what came to be The Bends. A very different atmosphere came from this album. Everyone learned Radiohead had passion, and energy from Pablo Honey. But this album gave a controlled feeling. As if the band now knew what they were doing with their talent. And they understood their own way of making music better. Upon release, The Bends was hailed as simply a brilliant album. Reviewers everywhere agreed it was an excellent LP. But still, it was mostly ignored by the public. The My Iron Lung EP release of 1994 had given everyone a taste of the new improved Radiohead which was to come. And that too, gained critical acclaim from reviewers. But peaked in the UK singles charts at #24. Other singles were relesed before the album, and they too failed to give it any momentum. All entering the charts at around 20th. Radiohead left England, who had again ignored them, and went on tour supporting R.E.M in the US. The country where they at least had some kind of fan-base. However, just after Christmas, the Street Spirit [Fade Out] single was released and climbed to a creditable 5th in the UK charts. The highest place any Radiohead release had reached so far. Suddenly, people started to notice The Bends, and Radiohead. Sales increased, and the album was added to many end of year best album awards lists. It started to climb the charts hastily and peaked at #4. Radiohead were back, and much better. They weren't one hit wonders, and scarily enough, it seemed like the best was yet to come. The Bends is simply an amazing album. There is not a single weak song featured on its tracklist at all. Best of all, it gels as an album superbly. The mood again remains very constant, but this time a more laid back style is taken. The guitars aren't being hit, they're being played. Lyrics aren't being shouted, they're being sung. Pablo Honey was far from a bad album, but The Bends is so much better that you'd think it was a different band altogether. The Bends isn't my favourite Radiohead album. But it contains my two favourite Radiohead songs... Fake Plastic Trees, and Street Spirit [Fade Out]. All the music on this album is fantastic. Each song says something, not just through the words, but the music too. As I said in my review for Pablo Honey, Radiohead had showed great potential, but didn't yet have the experience to realise it. This album is Radiohead realising their potential. And more.